Is your bathroom beginning to look outdated? The shower has become the focal point of the modern bath. 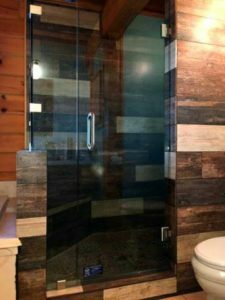 Shower doors have made many changes over the last decade. 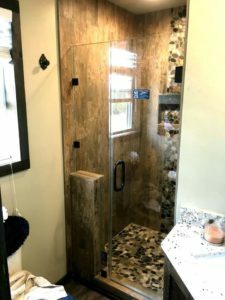 Old style shower doors are quickly becoming a thing of the past. Heavy glass can quickly modernize the typical bathroom. In the past shower doors were thin and flexible, so they needed a metal frame to give them support when opening and closing to prevent them from breaking. Today’s heavy glass shower doors are 3/8” thick allowing the door to stand alone which prevents the need of a frame. When you open and close them they are sturdy. Heavy glass shower doors give you that modern, sleek, look without all the hardware. SHOW OFF YOUR BEAUTIFUL TILE WORK! A heavy glass door allows more design freedom. Much less hardware is needed using simple clips, handles and channels which will greatly reduce any visual intrusion of the metal framework. If you have beautiful tile work; show it off with less visual obstruction by using heavy glass shower doors. SMALL BATH – BIG IMPACT! Going frameless will give you the biggest impact on updating your bathroom. Exponentially increase the visual size of a small bathroom with a frameless shower door. 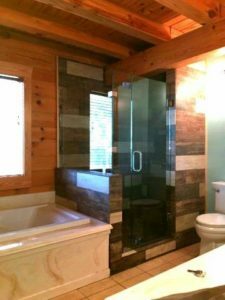 If you have a bathroom that is beginning to look a little outdated call STEWART GLASS & MIRROR and let us update it with heavy glass shower doors. Call us at (409) 384-4614 and let us create your dream shower. We provide 24 hour emergency service, auto glass repair and replacement, residential and commercial glass services. Stewart Glass proudly serves Jasper and the surrounding areas.